This infographic details one of the most significant innovations in the oil and gas industry in recent times, pad drilling. 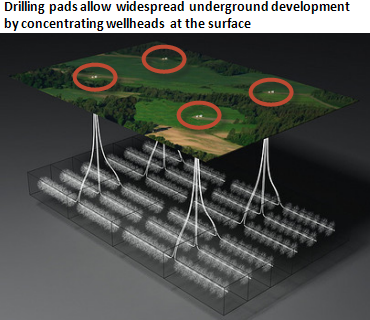 Essentially, pad drilling is the practice of drilling multiple entry points into wells from a single surface location. Prior to the discovery of pad drilling, an operator would drill a single well, disassemble the drilling rig, move it to a new location, and then repeat the process. Pad drilling allows up to twenty or more wells to be drilled from a single drilling location. This innovative technique reduces drilling cycle time and the overall cost of operating wells, while leaving a smaller footprint on the surface of the well. Also, fewer access roads need to be constructed and fewer trucks to carry the materials, further reducing the environmental impact. Pad drilling originates from offshore drilling and gained notoriety with its onshore counterpart as recently as 2004. In the U.S.A., the number of pad drilling wells grew by a factor of four, just since 2012.